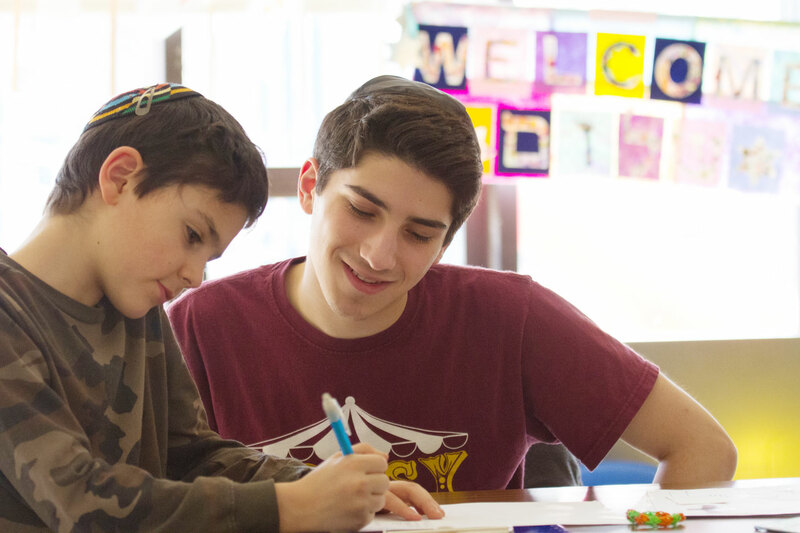 Welcome to the first in our series of “virtual walk-abouts” to extend your reach in Jewish Detroit and beyond. Follow us each month as we explore another block – or two, or three – in all the directions where we’re moving, working, playing and enjoying life in Metro Detroit. With new restaurants, bars, shops and showcases of development blossoming in Bedrock’s downtown domain in the central business district, why wait for a spring thaw to enjoy some of the city’s hottest spots? A spin around Campus Martius or a brisk walk around a few blocks along the spokes – Woodward, Broadway, Griswold – will be enough to warm your heart and lift your spirits – even on a grey day in February. With more than 85 properties, nearly 14 million square feet of commercial and residential real estate and more than 17,000 parking spaces in downtown Detroit, the Bedrock team is at the intersection of a new high-tech corridor driving the resurgence of the city. At last tally, the Bedrock investment has eclipsed the $2.2 billion mark. Let’s see, so much to do, so much to . . . eat. Let’s begin. Breakfast is served any time at The Dime Store, 719 Griswold Street inside the Chrysler House. “Like a warm hug,” a popular breakfast spot with a bar, serving made-from-scratch comfort food, craft beer and cider. 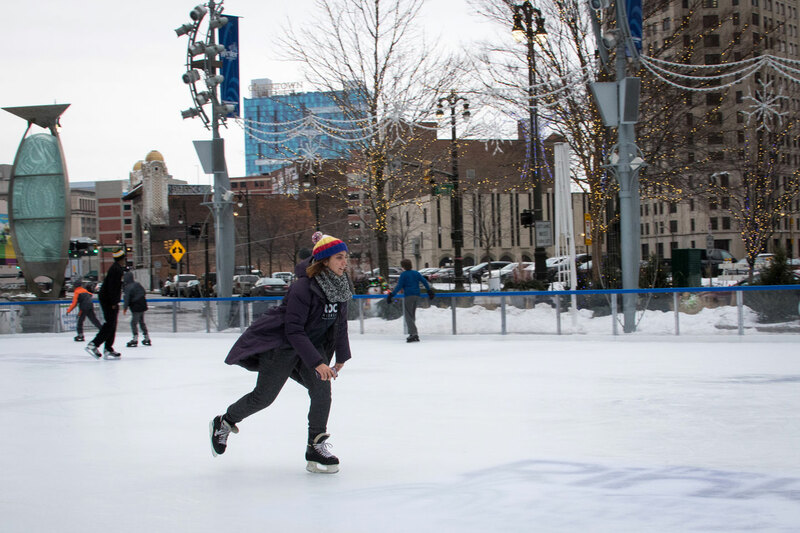 Head to the Rink at Campus Martius Park, 800 Woodward Avenue. Get out there and show your stuff or sit warm and toasty in the Rinkside Bar. Townhouse Detroit, 500 Woodward Avenue. Home of the Original 10-ounce Steak Cut Burger made famous in Birmingham. Loads of choices from bar snacks to Lamb Bolognese. Central Kitchen + Bar, 660 Woodward Avenue, facing Cadillac Square. Classic American fare with a sophisticated and modern upgrade. Beyond burgers,super veg choices include flatbreads and a roasted cauliflower salad to binge for. BonBonBon, 719 Griswold Street. Good people deserve good chocolate. Chocolate goodies with unexpected flavors to blow your Valentine away. Try the #10 Luxardo candies, Michigan cherries with dark chocolate ganache or, the #15 Better Butter Crunch with Detroit’s favorite potato chips, milk chocolate and sea salt. Detroit Water Ice Factory, 1014 Woodward Avenue. Best-selling author, turned social entrepreneur, Mitch Albom founded the Detroit Water Ice Factory as his way of saying, “Thank you, Detroit.” 100% of the profits from the shop’s icy treats, hot drinks and menu items go to Detroit’s neediest citizens through S.A.Y. Detroit (Super All Year) charities. Punch Bowl Social, 1331 Broadway Street. Eliminating the choice between good food and drink, and bowling, all under one roof in a playful industrial, Victorian and modern design. Moosejaw Detroit, 1275 Woodward Avenue, two blocks north of Campus Martius. Great gear for the Michigan outdoors and urban trekkers. John Varvatos Detroit, 1500 Woodward Avenue, Wright-Kay Building. Designer men’s clothing with a rhythm all its own. NoJo Kicks, 1220 Library Street. High-end exclusive sneakers, geared to high-style shoppers for Retro Jordan and Rare Nike, Yeezy, Adidas Sneakers, hats, clothes and more. Citizen Yoga, 1224 Library Street. A second location for Kaycee Must, building a yoga citizenship with a downtown practice and a warm invitation to a studio with a cool street view. Henry the Hatter, 1307 Broadway Street. Detroit’s exclusive hatter since 1893 continues to provide one of the finest selections of hats and caps in the Midwest. The Z, 1234 Library Street. Ten color-splashed floors of parking, featuring the curated work of 27 muralists and graffiti artists of international fame. 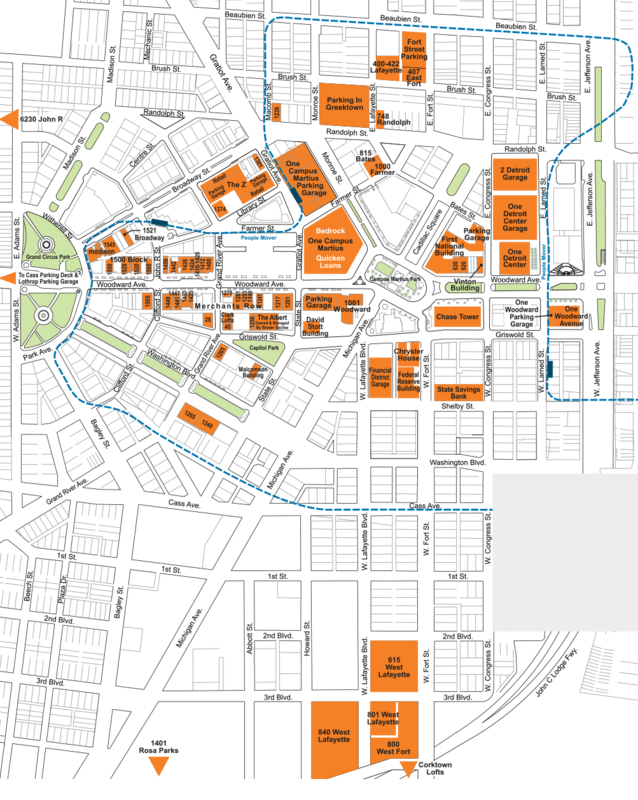 The lot zigzags between Broadway and East Grand River to the corner of Library and Gratiot in downtown Detroit. Next month: Moving Up to Midtown!